Harmonic trading… let’s start from the beginning. H.M. Gartley was a prominent technical analysis that looked into specific retracement patterns. 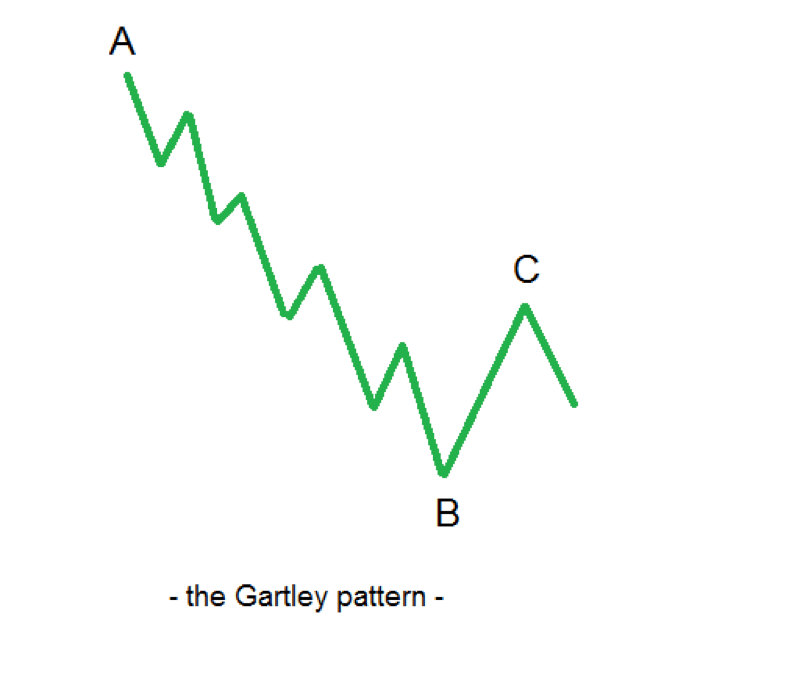 One of them bears his name to this day: the Gartley trading pattern. In time, the original Gartley pattern suffered some changes. Technical analysis as we know it changed and will continue to change. Think of personal computers, for example. A few decades back, technical analysis consisted of charting with pen and paper. Price action derived from real humans buying or selling. Speaking of price action, while I do use strictly price action strategies, the aim of this article is to show different approaches to technical analysis. You’ll find out some of them are simply remarkable. As you have seen from my past articles, I am doing my best to show you the whole picture. I believe that is the best approach if you want to understand how other market participants are thinking, too. This will help you understand the market better as a whole. Nowadays, supercomputers run complicated trading algorithms. They buy or sell financial products in a blink of an eye. They read the news in an instance and in the same moment take hundreds or more trades. No human does that. As such, trading changed, and the approach to trading changed. The way traders use technical analysis changed. And it will continue changing along with future technological changes. Harmonic trading as we know it today originated from Gartley’s work. Like in the case of Elliott Waves Theory, back in those years, the method derived from the stock market. If you apply the same Gartley principle to today’s Forex world, results will differ. This is normal. Volatility differs, and the market is much bigger. While it reflects human behavior, this is “diluted” by the huge number of forces that drive prices. Back in 1950’s crowd behavior was easier to predict. The beauty of the original Gartley pattern comes from the money management system involved. Money management with Gartley allows for hefty 1:3, 1:4 or even more as risk-reward ratios. When you think of harmonic trading, think of retracement levels. In a bullish setup, first, identify a strong bearish trend. Price action should see little or no retracement. If you want a Fibonacci and Gartley approach, look for no swing above 61.8% of the previous move lower. The series of lower highs overwhelms. Bulls look trapped. Gartley labeled this segment A-B. The longest in the pattern. And then, suddenly, bulls catch a bid. This is the B-C segment. How do we know this bounce matters? The answer comes from the A-B characteristics: the lower highs series gets broken by the B-C segment. Typically, when the B-C happens, traders begin to cover their short positions. When the short covering ends, the B-C ends. By the time the B-C move ends, the price sees a small decline between 33% and 50% of the B-C length. That’s the entry place for a long trade. The decline makes sense from a crowd behavior. The bears that missed the A-B decline waited for a meaningful pullback (the B-C) to sell short. That minor decline after the B-C segment ends gives the entry on the long side. The B lows give the stop loss and 1:3, 1:4 risk-reward ratios result. Important: It is not by chance that the risk-reward ratio is so big. It shows that the pattern fails quite often. >>>Because of that, in time, various technical analysts made changes to the original Gartley pattern. And so, harmonic trading appeared. Larry Pesavento took Gartley’s original work to a new level. Because of him, the Gartley 222 pattern became a well-known harmonic pattern today. The “Gartley 222” method as described by Pesavento derives its name from the page no. 222 from the original Harold’s Gartley’s book. Three out of four trades end up in profit. 75% of the time, the move from A will terminate at D at around 61.8%-78.6% retracement of XA distance. On top of these, Pesavento found that sometimes the AB=CD rule gives a price target that stretches beyond point X. When this happens, the move will further continue in the same direction. Moreover, when the AB=CD gives a price target around the X point, a double or a triple pattern forms most of the times. While the Pesavento approach is clearly a step forward to harmonic trading, it was not enough. It still leaves a lot of room for interpretation. Carney was a student of Pesavento. He didn’t like to leave to many possibilities for the retracement levels, so he worked on finding a better approach. 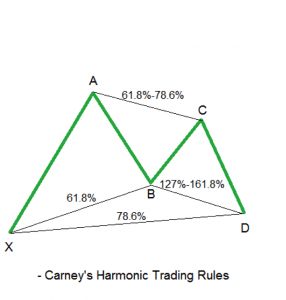 Carney’s approach to harmonic trading was made public at the turn of the century. 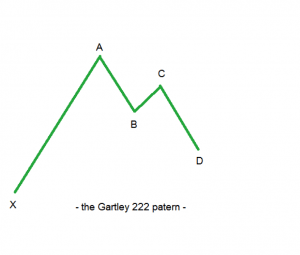 His approach uses specific Fibonacci ratios between the Pesavento’s Gartley 222 pattern. This is the base for modern harmonic trading. Bullish butterflies, bearish bats or crabs, and so on…the very definition of these patterns derives from Carney’s approach to the original Gartley pattern. Nowadays, automated software spots bullish or bearish Gartley patterns. Moreover, on the MT4 Platform and other trading platforms, a sound alarm signals when such a pattern appears. Traders need to know that harmonic patterns work best with a sound money management system. Before defining the target, one must deal with the potential loss. For this, risk-reward ratios help traders survive in the market. Believe it or not, the first task is to make sure you’re there to trade another day. Then, to make a profit. Traders must understand what drives the Forex market. What is the reason for the market movements? Retail traders do not cause these moves. NOTE: Statistically, only about 6% of the daily Forex turnover represents retail traders’ transactions. The rest comes from high-frequency trading, mergers, and acquisitions, brokers, liquidity providers, commercial and central banks, etc. Because of that, traders need a stop loss for every trade. Moreover, a risk-reward ratio that makes sense. Harmonic patterns provide them both.